More than a dozen charities have pledged to reform the "broken" system for reporting on grants. 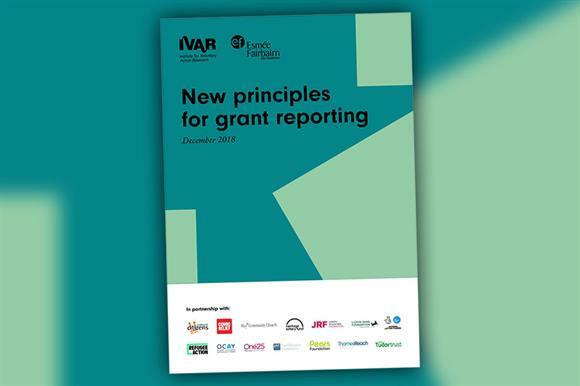 New Principles for Grant Reporting, published today by the Institute for Voluntary Action Research and the Esmée Fairbairn Foundation, outlines a set of principles aimed at improving a system the report says is too often "burdensome rather than useful". The report, drawn up with support from a group of grant-makers and front-line charities, including the Big Lottery Fund, Comic Relief and Thames Reach, acknowledges that reporting requirements can waste resources, with charities sometimes asked to "repackage similar information for different funders, on different dates, with different word counts and in different formats". The report outlines six "high-level principles" designed to change the culture of grant-reporting, with an onus on funders to alter their approach to the charities they support. Work with charities to agree on what grant reporting will involve, with a commitment not to change these requirements. "The power to make things happen – to do things differently – rests with funders," the report says. It suggests that one effective reform would be for funders and charities to rely less on written reports and more on conversations about their shared aims. Other charities and funders have been invited to provide feedback on how these principles might help them. Eliza Buckley, head of research and development at IVAR, said: "Funders are thinking more and more about how they can make life easier for the organisations they support. "These principles for aligning grant reporting form part of our work to support developments in grant-making, and we’re really excited to see how they work in practice." The report includes testimony about how some funders are already applying these principles. For example, the Lloyds Bank Foundation for England and Wales says that "we are reducing the amount of bespoke reporting we require of our grantees, and want to tell grantees more clearly how we use the information they provide to learn and improve". The Paul Hamlyn Foundation says it will review its grant-making process to include the principles. Caroline Mason, chief executive of the Esmée Fairbairn Foundation, has written a piece for Third Sector about the report.